A diabetic woman from New Jersey won the United Airlines NYC half marathon lottery and decided to complete the race—even when she found out she was pregnant. Sometimes it feels hard enough to even get out of bed in the morning with a belly so big. But unless the doctor orders differently, we know that staying active, fit and healthy during pregnancy is hands down the best option for both mother and baby. 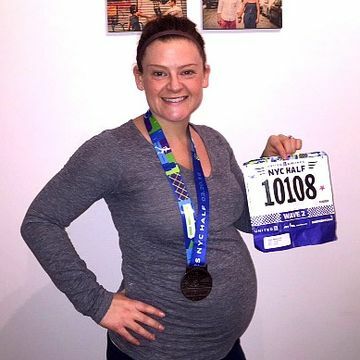 35-year-old Jersey girl, Nicole Graham, strapped on her sneakers and watched the streets of New York City heat up underneath her as she moved toward completing a half marathon—at 23 weeks pregnant. Energized by motivation, the life forming inside of her and some game-changing snacks, she hit the finish line—then gave us the scoop. Fit Pregnancy: Can you tell us more about the race itself? Nicole Graham: It was a half marathon, which is 13.1 miles. We started in Central Park and ran down through the middle of Manhattan. I wasn't concerned about my time, but it ended up being the best I could have asked for. I was about three miles in and felt the worst I did the entire marathon when I was making it up some steep hills in the park. Mentally, I was expecting the worst so I ended up being totally prepared and even shocked by how smoothly it went. I was anticipating plenty of difficult moments, but I was elated crossing that finish line and seeing my husband and a few close friends. FP: Why was it so important to you to complete this half marathon at 23 weeks? NG: I was chosen from a lottery to participate in the race before I even knew I was pregnant. I didn't want to pass it up and use my pregnancy as an excuse. I make sure I prioritize my health because about five years ago I was diagnosed with type 1 diabetes. It kind of added this whole extra layer of needing to be healthful. During pregnancy, it's extra important because of the complications that could come along with the diabetes. FP: So how did you train? NG: A lot of me being physically prepared for the race had to do with the fact that this really is just a continuation of the healthy lifestyle I'm already living. I always run quite a bit, spin and strength-train. I play it by ear, but fitness is important in my life. I try to exercise during pregnancy as much as I was working out before pregnancy. Physically, I do feel very different and I've slowed down in a lot of ways, but I'm still doing all of the activities I was doing before. FP: Did your diet change as you prepared for the race? NG: I'm a carb counter! But that's because of the diabetes—not the half marathon. I am really careful about what I eat relative to my activity level. I do eat healthy, but I try to respond to what my body needs. During the race I made sure to stay hydrated and kept a few Clif Shot Bloks on hand. Those really helped!